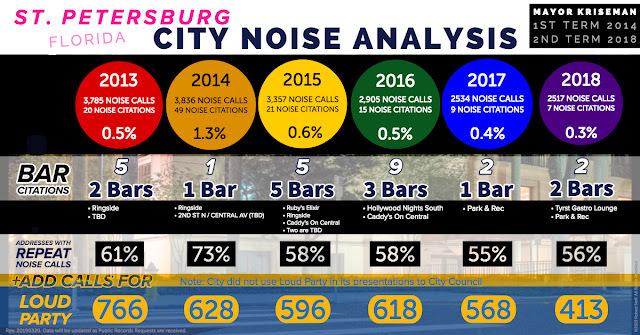 No wonder City of St. Petersburg residents have complained about the noise so much. The noise citation rates are abysmal, and getting worse! From 2017 to 2018, the repeat calls increased while the number of calls dropped by 18 and percentage of citations dropped. Also, the City is not addressing Loud Party calls, and should. If anyone has to wonder why there are so many calls and so little citations, the police VERY RARELY issue citations, according to the data. Then again, residents who complain about bar noise already know this. For those who need proof, just read Mayor Kriseman's email to Police Chief Holloway. Then you will understand. What a waste of resident tax dollars to have police officer respond to a noise call knowing the Mayor is not enforcing the noise ordinance! 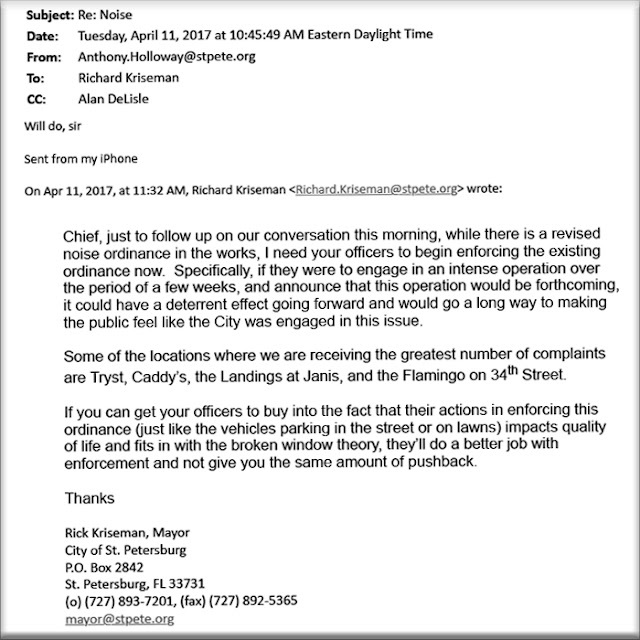 The new noise ordinance revision does not change the distance or times, just penalties. Residents need a noise ordinance with a decibel standard, but that won't happen with this Mayor and City Council, as long as the bars have so much influence. Remember, the Mayor and City Council members do not live near a bar, and cannot relate to listening to noise for 6 hours, not being able to watch television, or having the walls shake! Will the Police database be ready to accept “Warnings” and track them? Will there be reports? Will there be benchmarks to measure how this new ordinance is doing? All good questions.